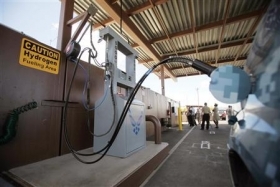 California last year unveiled a scaled- back goal that envisions 68 hydrogen stations by 2016. Pictured here is a special hydro-cell vehicle getting refueled in Honolulu on July 19. LOS ANGELES (Reuters) -- In October 2004, then-California Gov. Arnold Schwarzenegger rolled up to a pioneering fueling station at Los Angeles International Airport in a hydrogen-powered metallic blue Hummer loaned to him by General Motors. The "California Hydrogen Highway," Schwarzenegger's vision to ensure that every Californian would have access to a hydrogen fueling station by the end of 2010, called for the state to spend more than $50 million to help deploy up to 100 hydrogen fuel stations that would serve 2,000 fuel cell vehicles. "We got 200 stakeholders around a table, literally, and mapped out who could get stations where," said Terry Tamminen, a top adviser to Schwarzenegger. The global financial crisis helped slam the breaks on dreams of a Hydrogen Highway, but the roots of green energy's mid-life crisis -- marked by a rash of recent corporate collapses in everything from electric cars to solar panels -- run far deeper. Other factors have contributed to the shakeout, which has happened as climate change has dropped down the list of Americans' top concerns. Many new companies were far too optimistic about their prospects and were selling products that could not compete on price against traditional transport and energy sources, not to mention increasingly cheap imports from China. Whether it's survival of the fittest or survival of the subsidized, there have been success stories, and there's even a little froth in the stock market. But as the sector moves beyond its youthful phase, it faces many of the same problems and nobody will be surprised by more failures. Apart from the success of Tesla Motors Inc. in putting nearly 10,000 of its pricey luxury electric cars on the road -- and the resulting run-up of its stock -- the electric vehicle sector has been among the biggest duds in clean tech. Major automakers like Nissan Motor Co., with its all-electric Leaf, and GM, with the Chevrolet Volt, bet heavily on EVs. But they are struggling to get over the high cost and lack of charging infrastructure, as well as questions about the short driving range of some models. Both Leaf and Volt sales have lagged well behind company expectations, and vehicles from startups like Fisker Automotive and Coda Holdings Inc. barely made it off the assembly line before the companies ran out of cash. Nissan CEO Carlos Ghosn, who plowed $5 billion into battery-electric technology, has backed down from an earlier forecast of 10 percent market share for electric cars by 2020. Ghosn's company sold 9,819 Leafs last year in the United States, well under its target of 20,000. "EVs are a really difficult sell today," Jim Lentz, the CEO of Toyota's North American business, said in an interview. "Until we see substantial change in battery technology it's going to be difficult to see EVs really take off." Automakers also are heading back toward Schwarzenegger's old friend: hydrogen fuel cells. Toyota's Lentz even used Schwarzenegger's term "hydrogen highway" to describe a network of fueling stations he expected to see between Los Angeles and San Francisco in the next few years. The Golden State last year unveiled a revamped goal that envisions 68 hydrogen stations by 2016 that will serve 10,000 to 30,000 vehicles. The stations, some of which are already in the works, are expected to cost about $160 million. California has awarded nearly $28 million for stations under development and allocated an additional $29.9 million for future stations. Development of renewable energy technology has been undermined by an explosion in fossil fuel production in the United States, particularly cleaner-burning natural gas -- a development that wasn't expected when many green energy projects were being dreamt up. Cheap natural gas "clearly has an impact on how much renewables we'll do," said Alex Urquhart, CEO of GE Energy Financial Services, the unit of General Electric Co that invests in energy projects. Despite questions about EV sales, the market has signaled continued interest in green cars. Tesla stock soared 64 percent from $55.79 a share on May 8 to $91.50 last Friday, May 17, after it reported its first ever quarterly profit after selling more battery-powered luxury cars than expected. Ironically, the 10-year-old company's first-quarter profit of $11 million was only possible because it sold $68 million in zero-emission vehicle credits to other automakers. But the overall direction of the green energy market has been down. Investors can get a sense of the amount of money that has been lost from the WilderHill Clean Energy Index, which tracks the performance of publicly traded green energy stocks ranging from solar and wind to rare earth minerals and water companies. The market value of the companies in the index has fallen from a peak level of $231 billion in late December 2007 to about $108 billion today, a decline of 53 percent, according to Reuters data. The S&P 500 over that period is up around 9 percent to an all-time high. And while the number of components in the WilderHill index has risen to 51 from 42 since 2007, the average market value of those companies has tumbled to $2.1 billion from $5.5 billion. Moreover, the index only reflects publicly traded companies. More has been lost by venture capital firms and other early investors in companies that never got much past the start-up phase. Fisker, for instance, raised close to $1 billion in venture capital money. "The industry has become much more efficient, much more purposeful. There's not this sort of green hype," said Vinod Khosla, the co-founder of Sun Microsystems who later joined Kleiner Perkins. In 2004, he launched Khosla Ventures, which is known for investing in next-generation energy companies such as biofuels maker KiOR. "What has changed is we make fewer bets and we plan on investing more in them and take more time." Automotive News contributed to this story. For Reuters' full analysis on green energy business trends, click here.